As I write this, I’m sitting in a hospital room in Miami looking over my son. He’s trying to sleep but the pain keeps waking him up. Parents absolutely hate seeing our children suffer. We would willingly take their place in an instant if possible. Of course, we are often helpless to do anything but pray. A blood clot was discovered in his upper right arm after it swelled twice its size. The skilled doctors moved quickly to remove the clot but with obvious concern. Most healthy 20-year-olds do not develop blood clots. “Venous Thoracic Outlet Syndrome” was found to be the culprit and surgery to remove his first rib was the solution. It was a shock to all of us and the reality hit hard. Dave was playing well for the University of Miami baseball team. He was leading his team with an amazing .579 batting average in ACC conference play (.328 overall) and was just starting to hit his stride. The last place he wanted to be was in the hospital…again. Now, before I go any further, let me quickly say that David is expected to have a full recovery and return to baseball in due time. While scary and disheartening, there are countless others facing far more devastating issues. We thank the Lord this did not result in a far greater tragedy. A few days before David’s six-hour surgery, I had finished reading Bill O’Reilly’s book, “Killing Jesus: A History.” It is not a religious book, but was helpful in better understanding the political and religious climate amidst the events leading to Christ’s crucifixion. As I sat watching David struggle through pain, my thoughts wandered to Jesus in the Garden of Gethsemane. As a father, I would do anything to protect my son. If I had the power, I would have cured his Thoracic Outlet Syndrome before a scalpel ever pierced his skin. If I had the power and my son was in anguish and asked me to take away the cup of suffering he was facing, I would not have hesitated. The Bible says God the Father had that power — but did not use it. That blows me away. Several days have now passed since I started this article. 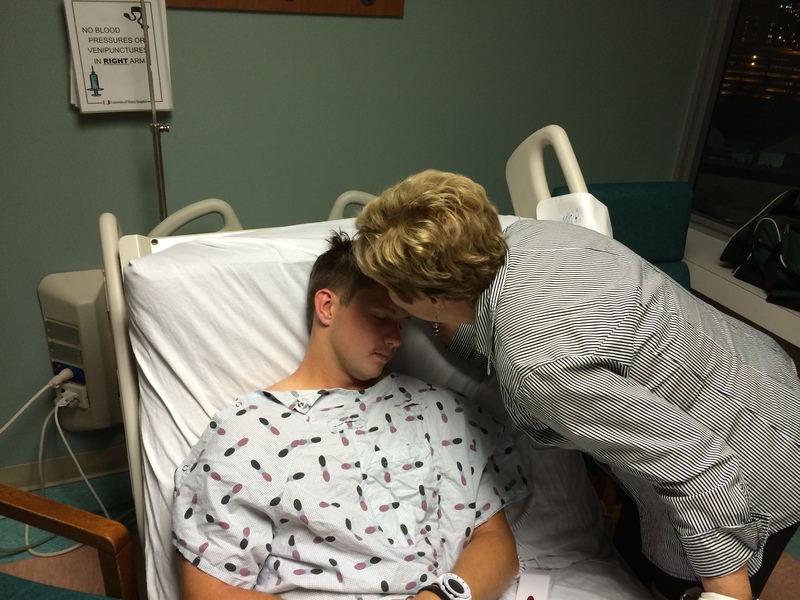 David was in the hospital for eleven long days and is now on the road to recovery. He can hardly wait to once again pick up a baseball bat and start swinging for the fences. We pray he has many days ahead to enjoy the game he loves and I will gratefully resume my place in the stands to cheer him on. It’s Easter, and I’ve thought a lot about God the Father’s restraint as He watched His one and only Son being crucified. Of course, He knew that death could not hold his Son. And He knew His Son, the perfect lamb, had come to take away the sin of the world (John 1:29).